Pizza Place Parking Lots: The Gerrymandering Issue in Pennsylvania | The Gettysburgian. On Tuesday evening, the lecture “Gerrymandering: Mapping the Future of Pennsylvania Politics” took place in CUB 260 at 7:00 p.m.. The event was sponsored by Pi Sigma Alpha, the political science honor society. The speaker at the event was Thomas DeLoe, who graduated from Gettysburg College in 1968, then went on to receive his Ph. D in Public Policy from Penn State. He is a retired researcher from Department of Health and Human Services and is currently a member of Gettysburg Area Democracy for America(GADA), an organization advocating for an independent commission that would redraw legislative and congressional district lines in the state of Pennsylvania for the 2020 election cycle. Starting off the lecture, DeLoe first explains the history of gerrymandering and how the action received its name. In 1812, Massachusetts Governor Elbridge Gerry signed a bill that redrew the districts, so it would favor a friend in the coming election. When newspapers reported this change, they commented on the strange configuration of a district, saying it looked like a salamander. A local newspaper published a political cartoon map of Massachusetts, with the odd-looking district being drawn as a salamander, called the “Gerrymander.” The name stuck and is now defined as the redrawing of geographic lines of congressional districts and state legislative districts in a partisan way to favor one political party. After explaining what gerrymandering and redistricting is, DeLoe finally arrived at his main point of the lecture: how terrible gerrymandering in Pennsylvania is and how citizens can fix it. Prior to its abrupt change after the PA Supreme Court issued a new map just a few weeks ago, most of the districts of Pennsylvania were obvious victims of gerrymandering, especially the 7th, 11th, and 12th districts. The 7th district, which encompassed most of the Philadelphia area, was widely viewed as one of the top three worst gerrymandered districts in the entire country. DeLoe exclaimed that the district was held together by drawing line through a pizza parlor parking lot and a citizen’s backyard for the entire area to be one continuous district. 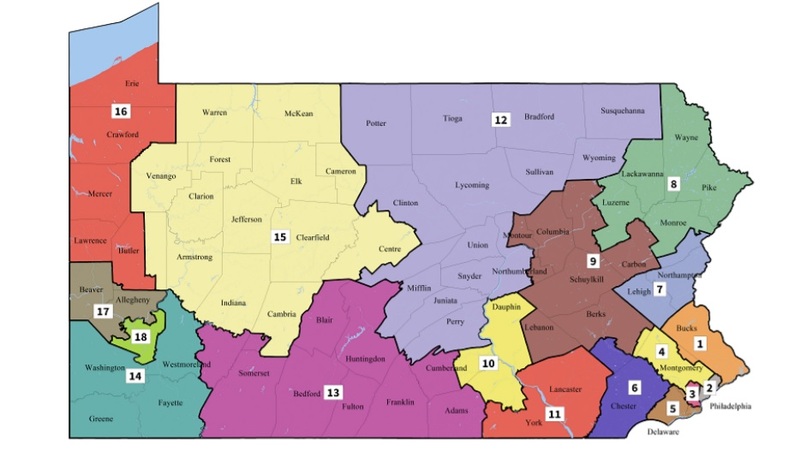 Currently, the redistricting for Pennsylvania is done by the state house majority and minority leaders, the state senate majority and minority leaders, and a selected fifth member as the chair of the committee. Depending which party is in majority and power at the time, the districts can stay relatively the same after the census every ten years or they could dramatically change. Gerrymandering comes into play when the party who is currently holding the power redistricts the state so that the constituents will vote in a way that will help that party win. To fix this issue and help relieve Pennsylvania of its gerrymandering predicament, there will need to be a change to the state’s constitution, which is not an easy task, DeLoe argued. An identical amendment must be passed by both houses of the Pennsylvania legislature in two successive sessions and must be ratified by voters in a referendum in the 2020 elections. The bill establishing an independent commission to draw congressional districts would create a more transparent and non-partisan and allow the public to have more input into the process, proponents argue. Le Doe was clear-eyed about how difficult passing such an amendment will be, considering the bill must pass in the current session as well as the next session to even have a possibility of being implemented by 2021. Less than a month ago, the Pennsylvania Supreme Court ruled that the state was illegally gerrymandered and instead of sending the job to the legislature, they instead did the redistricting themselves, in hope that the districts will now be more balanced out and each party has more fair representation in each district and there are fewer “wasted” votes statewide. DeLoe ended his lecture by encouraging all who were in attendance to call their state government officials and tell them to pass the bill that has been created. In his eyes, this is a great, non-partisan bill that will help remove the major issue of gerrymandering that the state of Pennsylvania has had dealt with for too long. Mary Frasier '21 is the Director of Photography and writer for The Gettysburgian, primarily covering news. Mary is a Political Science and History double major with a Women, Gender, and Sexuality Studies minor. In addition to The Gettysburgian, Mary is also the student assistant at the Civil War Institute, the ToDragma Reporter for Alpha Omicron Pi, a member of College Democrats, and a PLA for El Centro. Follow her on Instagram @maryfrasier98.